We typically conceive of books as a silent medium of communication. However, before the twentieth century they were frequently read aloud and in company — an experience we’ve revived with the proliferation of audio books and other sonic media. This seminar, therefore, revisits that most fundamental writerly question – what does it mean to have a voice? – by tracing the history of the written word alongside the development of various audio-recording devices. What does it mean to read literature as a technology for capturing specific voices? More urgently, how does it impact the ways in which we associate particular voices with different categories of difference, such as gender, race, class, sexuality, and disability? Taking the earliest replayable recording of human speech from 1860 as our starting point, we’ll focus on a wide range of literature and other media to think about the voice’s role in defining the human, in opposition to the animal and the machine. 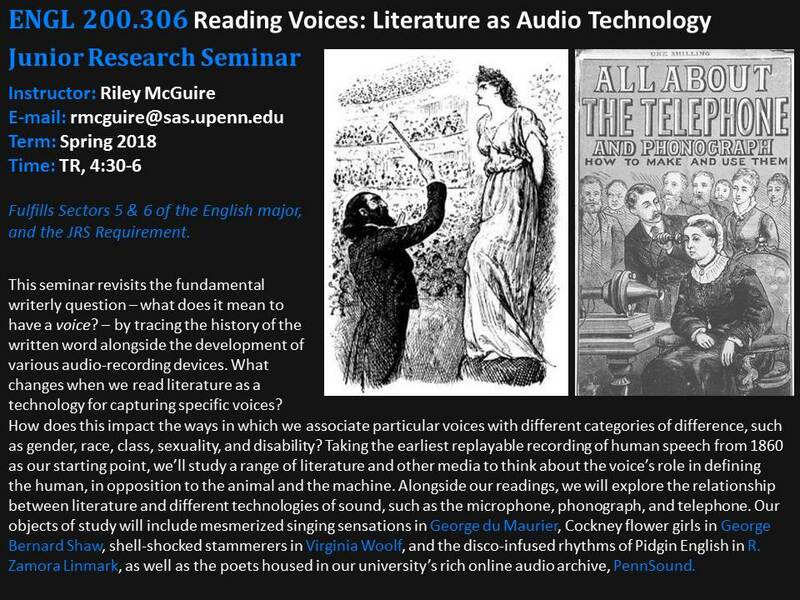 To contextualize our readings, we will explore the reciprocal relationship between literature and different technologies of sound, such as the telephone, microphone, and phonograph. Our objects of study will include mesmerized singing sensations in George du Maurier, Cockney flower girls in George Bernard Shaw, shell-shocked stammerers in Virginia Woolf, and the disco-infused rhythms of Pidgin English in R. Zamora Linmark, as well as the host of poets housed in our university’s rich online audio archive, PennSound. As a Junior Research Seminar, this course provides students with the chance to hone core research skills and practices key to writing about literature and culture. In addition, the seminar will provide students with opportunities to engage in creative forms of vocal performance: spoken word, poetry, singing, recitation, etc. No performance experience is necessary other than a voice and a willingness to explore its possibilities.